As Bloomberg's Michael Regan writes, "pinpointing the exact level of Treasury yields that will break the back of the bull market has become the trendiest parlor game in town." Earlier today, Tom Lee of Fundstrat became the latest to chime in, predicting that rates - which are rising due to reflation, - should support higher P/E ratios until interest rates are above 4%. Then, it was Jeff Gundlach's turn. Recall that it was Gundlach who during a DoubleLine webcast on January 9 predicted that if the 10Year goes to 2.63% - it was at 2.50% then - "stocks will be negatively impacted." However, he also added that if the 10Y TSY passes 2.63%, it will head well higher, likely pushing toward 3%. Gundlach also was the first to note that he expects a 3.25% print on the 10Y in 2018, a target which was since adopted by both Goldman and, today, Bank of America. Fast forward to today when speaking on CNBC, Gundlach estimated the fair value on 10Y yields in the USA to current nominal GDP. The gap is notable as current nominal GDP prints are above 4% with 10y yields below 3%. Let’s start out with something people think I know something about, which is the bond market. And it seems that bond yields, let’s just talk about the ten-year treasury, are at a level that makes a pretty good of sense right now. I mean they’ve gone up a decent amount so far this year – ended last year at about 2.41% or so, they’re up 46 basis points or so. But one thing that people talk about is nominal GDP, and I’ve been talking about this for a long time. It’s a fairly good starting place, where you think about maybe the ten-year treasury should be. Obviously there’s a lot of noise. I mean, they don’t track each-other anywhere close to perfectly. But it’s sort of like a dog that’s tied to a stagecoach that’s going across the country. It’s on a 100 foot rope, I mean, sometimes it will be behind the stagecoach and sometimes ahead, but if the stage coach is nominal GDP, and the not ten-year yield is sort of a dog, and yeah, there will be variation, one versus another, but they’re both going to end up going across the country together. There’s no way the dog can really stay that far away from the stagecoach. 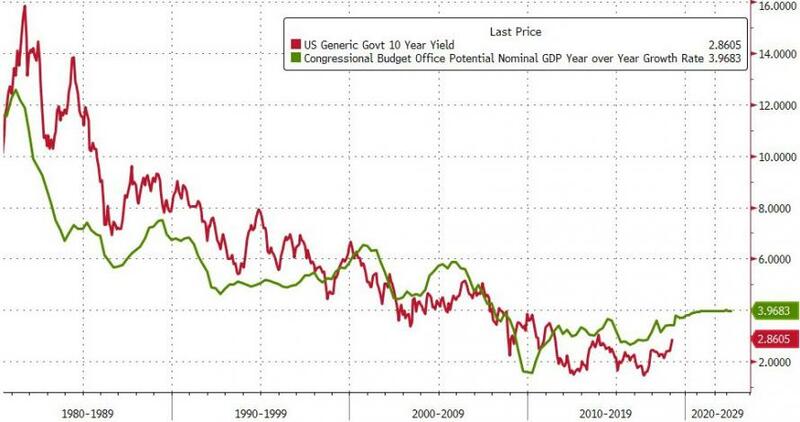 So what’s going on now, nominal GDP in the united states is at 4.4%, which sounds really high compared to the 2.87 10-year treasury yield. But to be honest, it’s also manipulated. We should talk about Germany as a good starting place. The German yield is way down at a ridiculously low level because it’s manipulated. So the economic facts of Germany and the United States are not that different. The nominal GDP is about the same, the inflation rates aren’t that different, manufacturing is good in both areas, retail sales are good in both areas, but the German yield is being manipulated. So when you think about a 10Y treasury yield, what we’ve been doing at Doubleline for the past few years really, is noting that it tends to reside in the average of nominal GDP and the competitor yield, which is the German yield. So let’s look at where we are today. I have a low conviction feeling that we’re going to break out to the upside on yields. When I talked at the Barron’s roundtable earlier in January, I talked about how rates would likely rise this year, and a lot of people agree with that. But right now the market is pressing right up against incredibly powerful yield resistance, particularly on the 30-year treasury bond. The trendlines are all gone on all the maturities of the treasury market. If you go to the trendlines back to the last 5 years, in many cases even the great bull market that’s over 30 years, the move up in rates since September has taken out all of those trendlines. In fact, interest rates across the yield curve, other than the 30 year treasury have been rising since September 7th at an annual rate of about 200 basis points. We’re coming up on almost five months into this yield rise, almost – really, coming up on almost six months now for this yield rise, they’ve been rising pretty quickly, but all the trendlines are gone. On the 30 treasury, you still have this one last line in the sand of – declaring that the bull market might still be intact and that’s the pivot point, which was the high yield back 18 months or so ago, and that’s at 3.22%. So fascinatingly, the 30-year treasury bond closed at 3.22% a couple of days ago, right there, and it didn’t close above it. So for now, we’re only 6 basis points away from this incredibly important level. So my viewpoint is this is a terrible trade location to be selling longer-term treasury bonds. I’ll put it another way - if long-term treasury bonds are a great sale at 3.16%, they’re also a great sale at 3.25%. And we’re going to let the market decide on itself, give a signal as to if this breakout is going to happen. If you force me to make a bet, I would say I do think they’re going to break to the upside. And when they do, they will accelerate. And if they accelerate, clearly what’s happened ever since 2.50% was breached on the 10-year treasury is the prices of treasury bonds and the prices have equities have started to become more correlated, meaning that when yields go up, stocks start to suffer. And I think, if we started to tack on significant yield with the breakout from these levels, it seems to me we would go back into another drop for risk assets. So with all that said, here is a convenient paraphrase from Citi, which - taking Gundlach's logic one step further - writes that perhaps a better metric for “fair value” or preferably a solid back of the envelope for 10Y yields is potential nominal GDP: this is also convenient because the CBO publishes this metric for years into the future. Finally, the chart below suggests that any move above 4% on the 10y bond is unlikely to be sustainable while current yields are closing the gap from obviously too low to just about right.